"Houston's Most Elite Hookah Lounge Featuring The Largest Selection Of Flavors!" Texas Hookah Lounge is a new hookah lounge located in Houston Medical Center area. The lounge offers the largest selection of shisha flavors in the metroplex, free-wifi, video games, snacks, BYOB(Bring Your Own Beer), hosts special events, full TV channel selection (ESPN, MTV, BET,CNN), and more. We are conveniently located in the heart of Montrose and Midtown area where we are surrounded by some of the best bars in Houston. We welcome everyone 18 or older with valid identification. 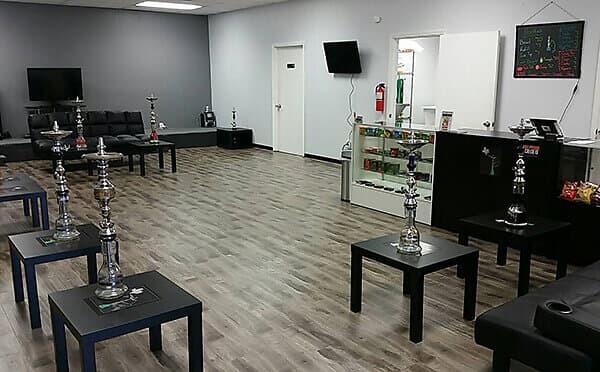 We pride ourselves in being the only lounge in Houston to offer the largest selection of shisha flavors along with the opportunity for our customers to mix and match shisha flavors to their liking. We are located across the hottest bars in Houston such as Anvil, Etro Lounge, and Boondocks. We want to be your premier pre-party or after party destination whether it be a weeknight or weekend. What’s unique about our hookah lounge is we have a BYOB policy and BYOF (Bring Your Own Food) Policy which allows you to bring in your own food or food from local restaurants which deliver to us. At our lounge we want you to play board games, video games, watch a movie or sports game, and just relax on our comfortable couches while we take care of your hookah smoking needs. We play a variety of music, or if you feel like you want to listen to your own music, feel free to plug in your music device into one of our stereo ports and become the DJ. We have a superior and knowledgeable staff who is ready to cater to your every request because we want you to have the best hookah experience possible! We are the only hookah bar in Houston to offer the largest selection of shisha flavors with the opportunity to mix and match the flavors of your choice. The Texas Hookah Lounge is owned and operated by the same owners of TexasHookah.com which is one of the largest online retailers of hookah products in the nation which allows us to carry a large varierty of name brand shisha flavors and keep on top of newest flavors that enter the industry. We carry Al Fakher, Al Fakher Herbal, Al Fakher Special Edition, Afzal Pan Shisha, Fantasia, Fumari, Haze, Hydro Herbal, Hydro Vapor Stones, Nakhla, Nirvana, Starbuzz, Social Smoke, Soex, Tangier’s, Tonic, Alchemist, and many more. If you have any flavor or brand requests please inform us and we will see if we can bring it to our location. The Texas Hookah Lounge offers private parties for all occasions, including birthdays, graduations, bachelor/bachelorette parties, holidays ,and business meetings. Please contact the manager for further details. Want to purchase a Hookah or smoke shisha? Texas Hookah Lounge is associated with TexasHookah.com which is one of the largest online hookah retail companies in the nation which sells a variety of different types of hookahs and flavors so be sure to ask the staff for store promotions going on at the moment.